The global growth in the rate of carbon dioxide emissions from fossil fuels was 4 times greater in the period between 2000 to 2005 than in the preceding 10 years, according to an analysis by the Global Carbon Project, a component of the Earth System Science Partnership (ESSP). Despite efforts to reduce carbon emissions, the global growth rate in CO2 has climbed to 3.2% in the five years to 2005 compared to 0.8% in the period 1990 to 1999, according to the data presented. The data puts carbon dioxide emissions over the last five years as tracking close to the A1B emission scenario from the Intergovernmental Panel on Climate Change (IPCC), according to the GCP analysis. "This is a very worrying sign," said Dr Mike Raupach, Chair of the Global Carbon Project. "It indicates that recent efforts to reduce emissions have virtually no impact on emissions growth and that effective caps are urgently needed." The A1 scenarios describe a future world of very rapid economic growth, global population that peaks in mid-century and declines thereafter and, in several variations of it, the rapid introduction of new and more efficient technologies. A1 is subdivided into A1FI (fossil-fuel intensive), A1T (high-technology), and A1B (balanced). A1FI generates the most CO2 emissions and A1T the least—but even A1T sees a near doubling of pre-industrial atmospheric concentration of CO2 by 2100. 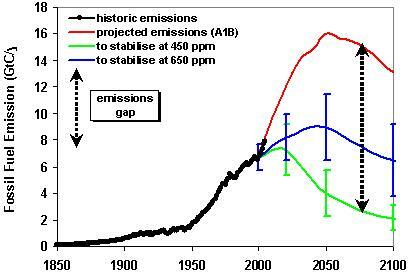 The A1B scenario assumes that 50% of energy over the next century will come from fossil fuels, and leads to unacceptably high atmospheric CO2 concentrations resulting in, according to some estimates, a temperature increase of almost 3° C in global average temperature by 2100 compared to 1990. (See chart at right.) 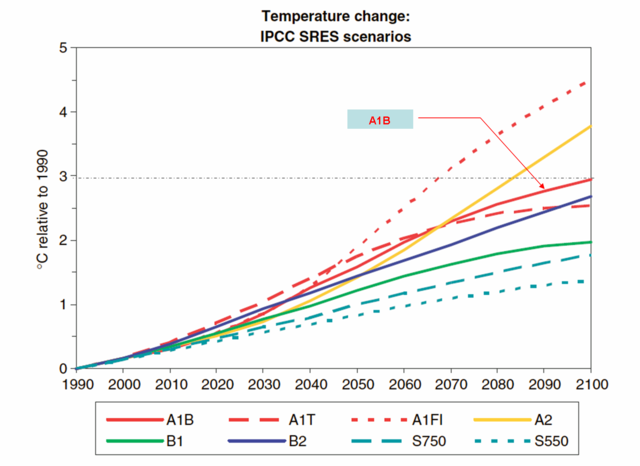 Other projections put the A1B temperature increase at 4° C.
"On our current path, we will find it extremely difficult to rein in carbon emissions enough to stabilize the atmospheric CO2 concentration at 450 ppm and even 550 ppm will be a challenge. At some point in the near future, we will miss the boat in terms of achieving acceptable levels of carbon dioxide in the atmosphere." Due to the phenomenon of environmental inertia, even when anthropogenic emissions do begin to decrease, atmospheric CO2 will continue to rise for up to as much as a century. Global temperatures will continue to increase for an even longer period, locking the world into continuing climate change. Effective management of Earth system inertia depends on early and consistent actions, notes the ESSP. The analysis was commissioned by UNESCO and was presented at an ESSP conference in Beijing and at the UN Framework Convention on Climate Change (UNFCCC) twelfth session of the Conference of the Parties to the Climate Change Convention (COP 12) meeting in Kenya. A sizable part of the large uptick in the rate of growth in global anthropogenic GHG emissions is likely due to the rapid industrialization and economic development of China and India in recent years. The staggering growth in these two countries, home to a third of the world's population, is having impacts on a global scale [which is why I continue to focus on these two countries here at Watthead (see the Eye on China series of posts, for example)]. Additionally, the United States, conspiciously absent from the Kyoto Protocal, has been reluctant to rein in it's large emissions, which continued to increase. Even the developed nations that have ratified the Kyoto Protocol don't seem to be on track to meet their emissions reduction targets at this point, although they still have time to redouble efforts and meet their targets. Time is running out to stabalize CO2 emissions at a level that will avoid damaging climate change. This much is becoming increasingly clear. The longer we wait - as a global community and as nations, communities and individual actors - to rein in greenhouse gas emissions, the harder and costlier it will be later to achieve significant enough reductions to avoid dangerous climate change. In fact, the window may soon close entirely on the possibility of stabalizing GHG levels at a low enough level to avoid significant sea level rise, widespread droughts, mass extinctions, and the other problems that will arise from a 3 degree C increase in global temperatures. Again, I will repeat a call for concerted and committed action, over the next several decades, and starting yesterday, to rein in greenhouse gas emissions at all levels of action - individual, local, national, global. We can't afford to screw this up, and we're clearly not on the right track now. It's time for a serious course correction - in fact, that time is becoming increasingly overdue.